A pecan cheesecake, over a pecan-shortbread crust, with a quick pecan pie sauce on top! 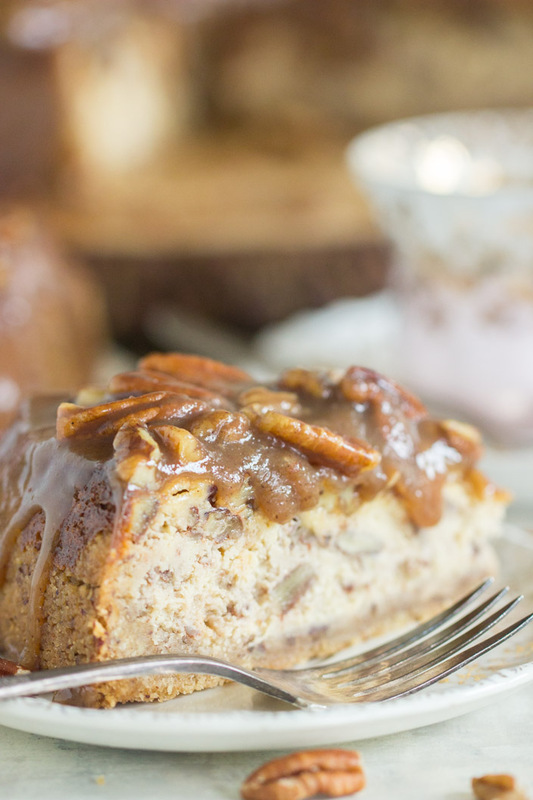 This Pecan Pie Cheesecake recipe does not scrimp on pecan pie goodness! It’s no slouch as far as creamy, rich cheesecakes go either! You’ll love this Pecan Pie Cheesecake recipe for getting the most out of autumn. DO I EVER HAVE A CHEESECAKE FOR YOU!!! Yes, shouting necessary! It’s too exciting not to be obnoxious with all capital letters. Need the capitals. This Pecan Pie Cheesecake recipe is two of the BEST kinds of desserts, mashed into one. 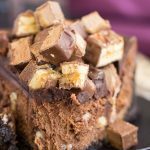 Are you a cheesecake fan? I got you. LOVE pecan pie? You’re good too. The best elements of both those desserts. 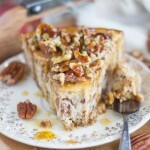 In fact, I think I’m going to make this Pecan Pie Cheesecake for Thanksgiving. 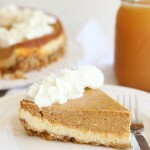 I usually make one of my pumpkin cheesecake recipes – either this Double Layer No Bake Pumpkin Cheesecake, or this Traditional Double Layer Pumpkin Cheesecake (or both), but I think that this Pecan Pie Cheesecake recipe is going to be a hit with my family, and I want to do something a little different this year. 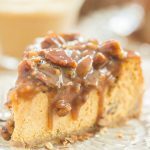 We’ll still make pumpkin stuff, of course, can’t leave out a pumpkin dessert, but this Pecan Pie Cheesecake is going to make an appearance too. It’s actually been a minute since I’ve gotten up a cheesecake recipe, but I have a few good ones teed up to share, and then I just came home from an epic grocery trip where I picked up a dozen packages of cream cheese for a few more coming up. It might not even be enough. We’re going to have a cheesecake bonanza around here soon. I hope you’re ready. On a side note, I really don’t care for grocery shopping. Has anyone ever tried one of those delivery services? I procrastinated going to the grocery store, and by the time I went, I needed so much stuff that I was at Publix for over an hour, and then I had to stop at Sam’s Club and Target too, and it was almost the entirety of my evening… not including unloading the car, unpacking the groceries, and putting them away. All in all, like 4 hours disappeared. Am I just inefficient? Running a dessert blog doesn’t ease things! I feel like I’m always at the store for something I forgot, or I’m always reorganizing my pantry to figure out how to cram more cans of pumpkin in there. Okay, so I’ve only said it about 4,000 times, but I LOVE my basic cheesecake recipe, and I’m not changing it up anytime soon. I’ve tried other versions, and I go back to mine again and again. I’ve used it for a million other cheesecakes, and it’s perfect. Creamy, rich, smooth, and silky. And EASY. That’s important. I’ve adapted my cheesecake base for this Caramel Apple Crisp Cheesecake, White Chocolate Pumpkin Cheesecake with Gingersnap Crust, Mocha Cheesecake, Maple Nut Cheesecake with Walnut Crust, Honey Pecan Cheesecake with Pecan Shortbread Crust, and about a dozen others, but those are the autumn-ish ones. For this Pecan Pie Cheesecake recipe, I made my fave cheesecake batter, but with brown sugar since that enhanced this pecan pie theme! 😉 I added pecans to the batter, and baked it over a pecan-shortbread crust. Then I made a quick pecan pie sauce, it only took about 10-15 minutes, and draped the whole cheesecake in it. 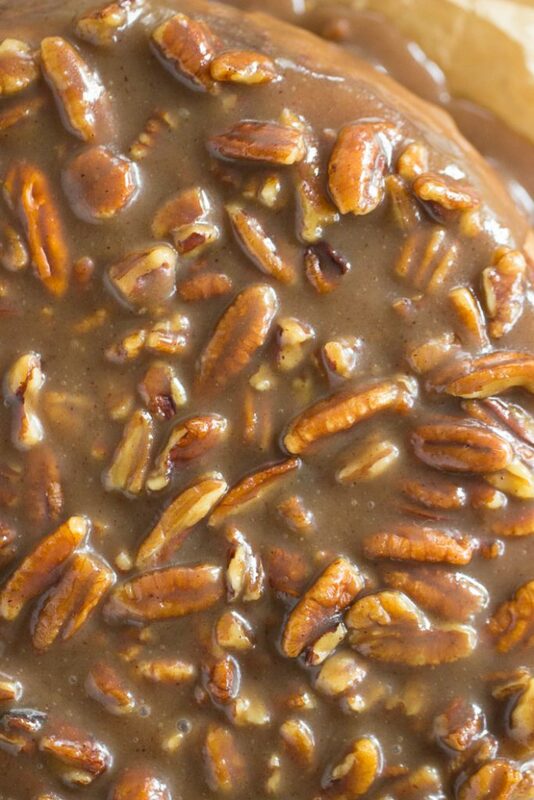 The sauce doesn’t set quite like pecan pie filling, but it’s nice and thick so it stays put on the cheesecake. 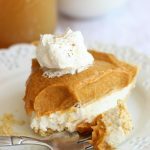 This dessert is soooo good, and if you love cheesecake and pecan pie, you’ve got to try this recipe! 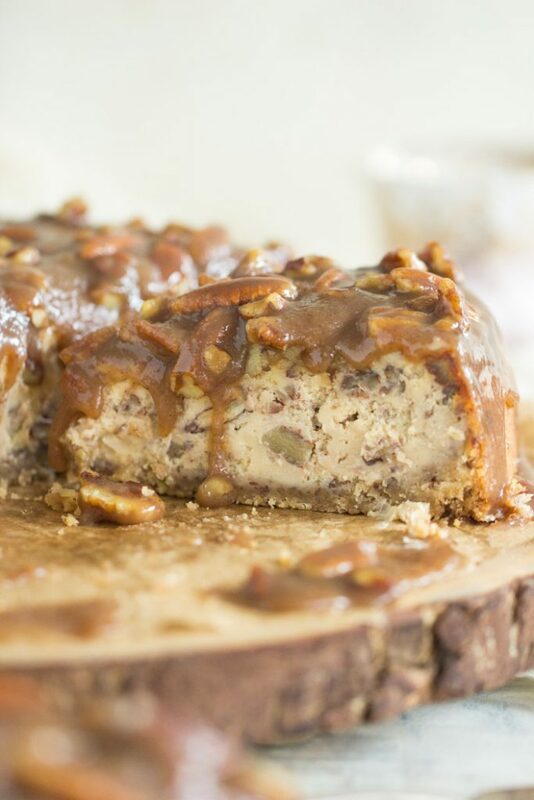 A pecan cheesecake, over a pecan-shortbread crust, with a quick pecan pie sauce on top! 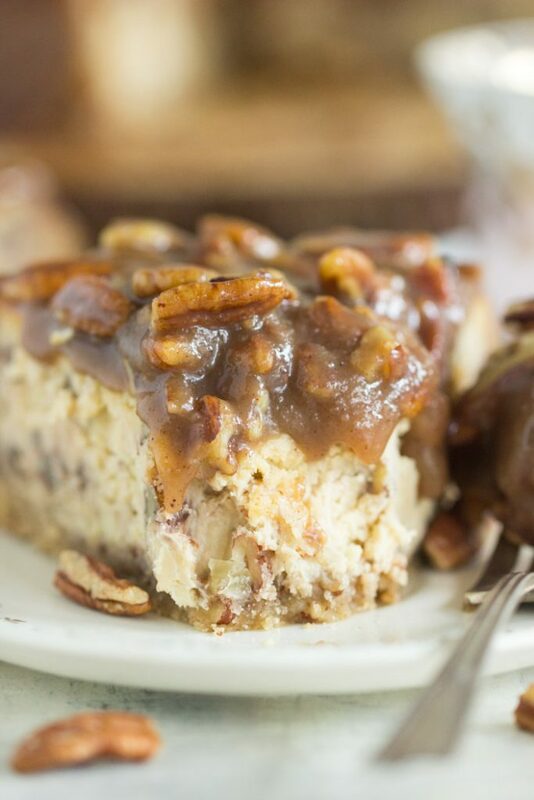 This Pecan Pie Cheesecake recipe does not scrimp on pecan pie goodness! It's no slouch as far as creamy, rich cheesecakes go either! 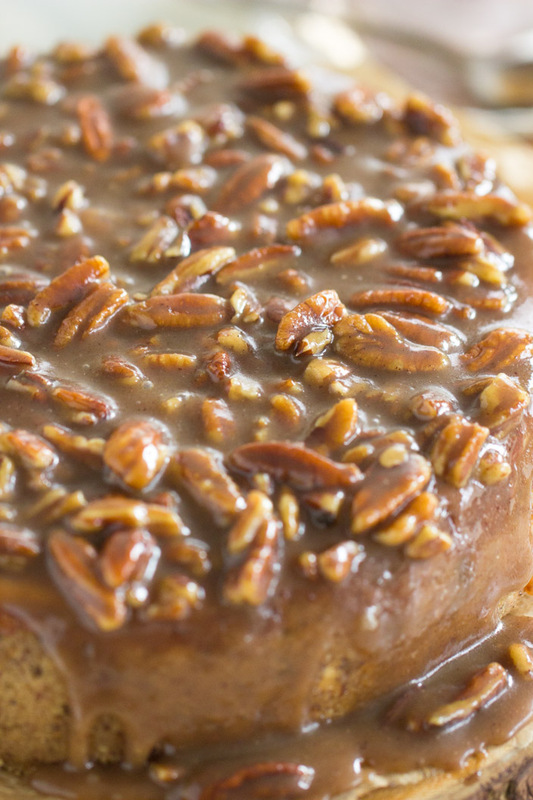 You'll love this Pecan Pie Cheesecake recipe for getting the most out of autumn. In a medium bowl, combine cookie crumbs, ground pecans, sugar, and melted butter. In a large mixing bowl, beat cream cheese until creamy and smooth. Add sugars and vanilla, beating until smooth. Add eggs, one at a time, beating well after each addition, and scraping the sides of the bowl in-between. Bake at 325 degrees for 60-70 minutes, or until the edges are golden, and the center is slightly jiggly, but nearly set. Run a knife around the sides of the springform pan, and release the cheesecake. Transfer to a serving platter. In a medium saucepan over medium heat, combine brown sugar, butter, and cinnamon. Stir in pecans and vanilla, and cook for an additional 2 minutes. Remove from heat, and add heavy cream. Let cool for about 10 minutes, or until it's nearly tepid. The sauce will thicken as it cools. Spoon over cheesecake, and refrigerate to set before serving, about 30 minutes is ideal. I’m nuts for pecan desserts, especially pies. 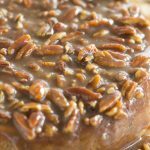 If you’re a pecan pie fan, check out these pecan pie recipes: Dark Chocolate Molasses Pecan Pie, Orange Coconut Pecan Pie, Chocolate Espresso Pecan Pie, or Brown Butter Bourbon Pecan Pie. 🙂 They’re ALL wonderful, and are lovely twists on the classic. Promise you’ll make this for Thanksgiving . . . it looks amazing! I just made another type of cheesecake today that I’m now thinking of making instead. Haha! Just got 4 pounds of Georgia pecans and need some serious baking therapy!! I want to make two smaller cakes and freeze one. I’ll freeze half the topping to add after the cake thaws. Any thing else I need to do? Thanksabunch. No, you should be good to do that! I think that’s a great idea. It’s hard to finish a whole cheesecake – we usually freeze half of ours anyway, so that’s a great idea! I did grocery delivery for a while with the hopes of creating more time. I found that I spent just as much time, if not more, trying to find crap on the ordering system. Plus, I am an efficient person. I have my route throught the store and know where all the stuff is. If I go at an optimal time, I can be in and out lickety split. I think it might work well if you consistently have the same orders, as you can do it in a few clicks. Not to mention, I don’t trust I am getting the best looking produce. Finally, this recipe looks nommy! Yes!! That’s my concern – I don’t trust that I’ll get good produce! I want to be able to pick out the most perfect stuff. 🙂 I try to go at off-peak times so at least I’m not shopping when it’s busy, but I sure do lose a lot of time shopping for food. You make an excellent point – putting together an order is probably almost as time-consuming. Thanks for the feedback! What size springform pan? 8 or 9 in? I typically use a 9-inch! 8-inch will work, but baking time will probably take a bit longer since it’ll be thicker! I hope you like the cheesecake!! This looks delicious! If I am making it a day ahead of time, should I make the sauce, reheat, and pour over before serving? Or would it be best to just refrigerate it with the topping on it? I would probably refrigerate it with the topping on! I like to chill my cheesecakes anyway, and with this sauce, I like it to firm up so that not too much runs off! It’s thick, but it does help to have it chill in the fridge, so that’s what I’d probably do. 🙂 I hope you like it! Good luck, and Happy Thanksgiving! I have a graham cracker crust for the pie, would that work or does it have to be the shortbread crust? Absolutely! That will work. You can most any type of crust in this cheesecake and most cheesecakes – Oreo, Golden Oreo, shortbread, whatever! 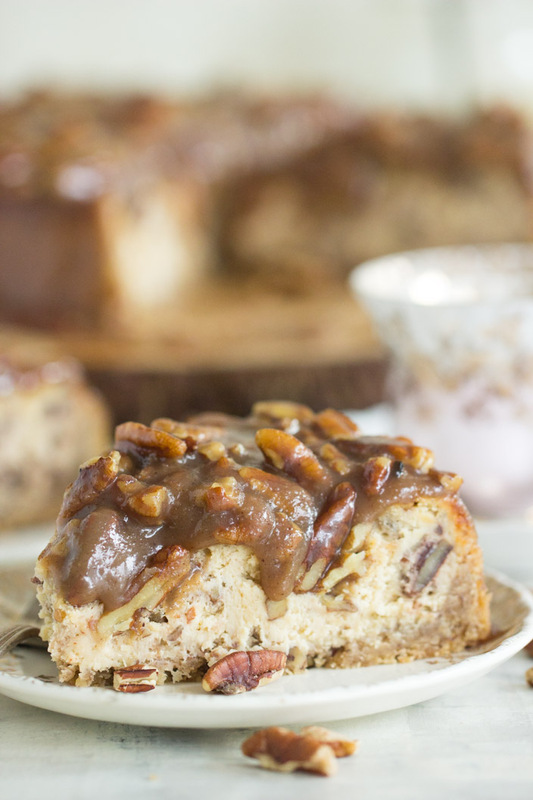 I liked using Pecan Sandies as the crust because then it carried over the pecans from the topping! Good luck. I hope you like it! Awesome idea! I love that. My aunt makes mini cherry cheesecakes almost every year, and it’s really fun to have mini ones for parties and get-togethers. I’m sure they’re a bit more work though! I’m so glad you caught that error – I used partial brown sugar, not complete. I used 3/4 c. brown sugar, 1/2 cup granulated sugar. I think when I used ALL brown sugar, it was overkill. Thank you so much for pointing that out. I’m going to fix it! Thank you so much!! Just made the minis and they’re terrific! Baked 18 min and they came out perfectly!